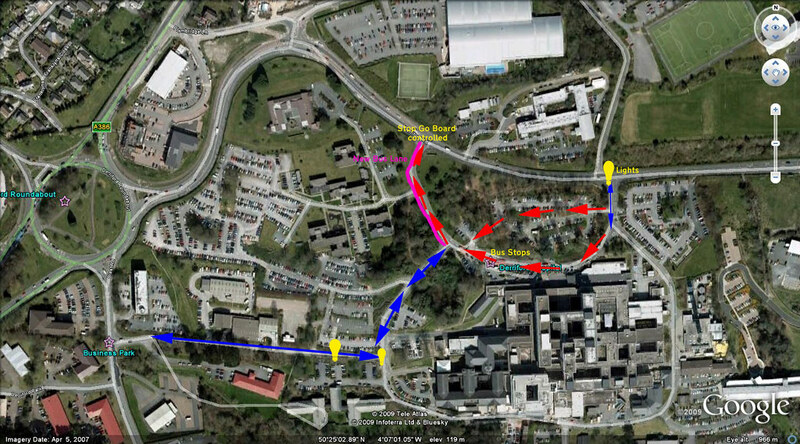 We have now had two days of the 'experimental' traffic management system at Derriford Hospital. As expected a lot of people have been upset about it! This story was actually posted at 11.10 am when traffic seemed to be moving fairly well from what I could see. That said it was certainly chaos at 5pm. Traffic was moving very slowly and we were waiting a long time for a bus home in the pouring rain. Everyone was moaning about the one way system in place blaming it for the congestion. This conveniently forgets that congestion like this is a regular occurrence at Derriford. It is not unusual for buses to sit in the Derriford loop not moving for ten minutes as traffic queues to get out of Derriford but is blocked by traffic queuing to get in at the other junction. The new system probably didn't help - but it certainly didn't cause the problems. Now is a good time to point out a few subtle differences in how the scheme is working from my map earlier in the week. The one way system does not seem to apply to the main entrance road (A&E side) with some traffic still leaving the site from this road. This junction is controlled by lights. The other main difference is the placing of traffic lights on Morlaix Drive where they only control the last 50 yards or so of this narrow road. Really not convinced they are making any difference there but the congestion has not been too bad along this stretch. The main problem I have with the scheme as it stands at the moment is that the one way exit road up to the mini roundabout could quite easily be two lanes but it has been 'managed' to make it less useful. You get two lanes merging into one at the bottom of the hill, from car park which then opens out into two lanes, only for the right hand land to be blocked off at the top meaning cars have to merge back into the left hand lane again. I understand this is to stop traffic entering the site here, but the junction is controlled by stop / go boards so anyone trying to turn into this road could easily be moved on to the next junction. There are plenty of signs warning of the one way system. Didn't see any 15s going towards Mainstone for quite a while either, although 3 came in the other direction. While we were waiting for our bus a Citybus Dart (203 I think?) departed from Derriford attached to the back of the Citybus Tow Truck. If the new boss at Citybus wasn't aware of Derriford Hospital before, he certainly will be by now! Plymothian Transit: Pain now - gain later?